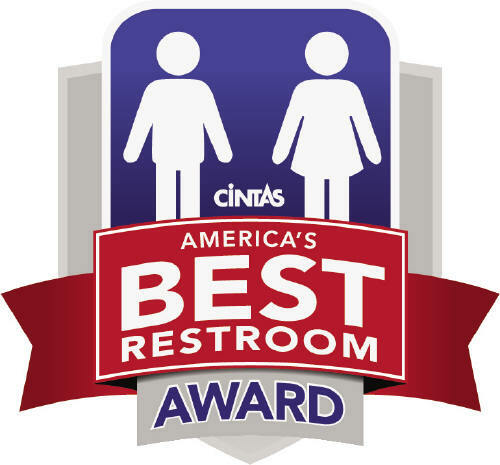 At a special press conference on October 22 at the Refuge Visitor & Education Center, Cintas Corporation announced that the Refuge’s Learning Lavatories were voted America’s Best Restroom® in its 2018 contest. Cintas revealed the ten contest finalists on August 6 and opened voting to the public through Sept. 18 on its website. In the finalist round, “Ding” Darling was up against nine other restrooms in towns and cities from Green Bay, Wisc., to Chicago and New York City. 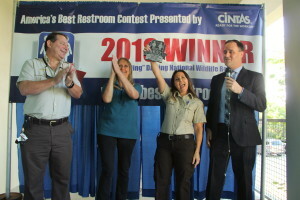 As the winner, “Ding” Darling received a banner and plaque to signify its “ascent to the throne.” Cintas will also award the refuge the “revered restroom treatment,” which includes $2,500 in Cintas products and services for restroom cleaning or facility management. Cintas’ judging criteria included cleanliness, visual appeal, innovation, functionality, and unique design elements. Funded by a $125,000 grant from the West Coast Inland Navigation District (WCIND) and contributions from private donors AWC Family Foundation, Middendorf Family, Laurie and Bill Harkey, and Chuck and Irene Raber, Project #LearningLav debuted in October 2017. It features educational imagery inside the lavatories and on the outdoor wall leading to them. 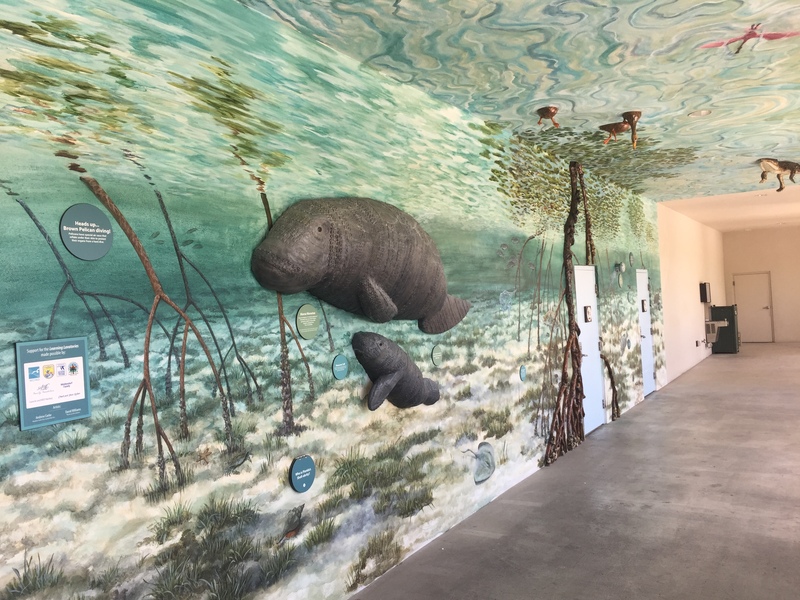 The outdoor wall and ceiling mural immerses visitors in a virtual underwater experience, where they come eye-to-eye with 3D manatees and look up to see an alligator and other wildlife sculptures swimming overhead. Inside, the lavatories were renovated to green standards and continue the interpretive underwater motif, featuring a photo-tile mangroves mural and more wildlife sculptures. Stall doors are wrapped with close-up professional photographs of refuge birds and identification information. Educational teaser messages were designed to entice visitors into the admission-free Visitor & Education Center to learn more. The #LearningLav project showcases the work of two artists. Sanibel artist Andrew Corke fashioned a mother and baby manatee out of recycled bike tires, while North Carolina artist David Williams sculpted other creatures out of foam and fiberglass and painted the lifelike sculptures and one-dimensional aspects of the murals. “We like to say that the restrooms have turned a ‘nature call’ into a ‘nature enthrall,’” said Paul Tritaik, Refuge Wildlife Manager. Watch a video tour of #LearningLav below. Click HERE to see an album of photos. Many thanks to the team that helped make all of this happen. Our Creative Team: Andrea Conners, Maggie Elliott, MaryBeth Greenplate, Amy Herd, Marilyn Kloosterman, Emily Koval, Jen McSorley, Toni Ory, Monica Scroggin, Sheridan Snell, Christine Szymanczyk, and Ann-Marie Wildman. Our Implementation Team: Carrie Alexander, Nate Caswell, Jeff Combs, Sierra Hoisington, Sarah Lathrop, Kathy McCabe, Birgie Miller, Paul Tritaik, Chelle Walton, and Toni Westland. And thanks to all of our loyal supporters who voted to put us in first place. "Ding" Darling Wildlife Society-Friends of the Refuge supports the J.N. "Ding" Darling National Wildlife Refuge through charitable contributions. Proceeds fund educational programs, conservation, and wildlife and water quality research. Look below for information on how to donate. Watch a video tour of #LearningLav.